Hello dear friends! Thanks for visiting me. Today I have our latest DZ Doodles Challenge for you. 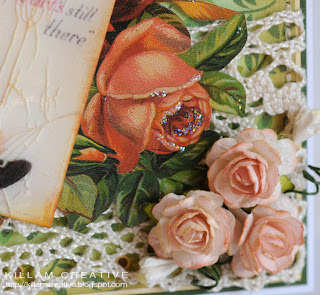 The DZ Doodles design team was challenged this week to create a project with the distressing technique. I've dabbled a little with it in the past with decent results. On this card I decided to "kick it up a notch". I had tears in the paper and my edges were rougher than ever before... then I added another layer and it covered up a lot. *grin* Still, I'm pretty happy with the results! I also distressed some edges with ink - a "must-do" on all my projects! I'm in love with Cosmo Cricket papers! This is from the Early Bird collection, called Farmer's Market. I used a sketch challenge for this card and needed at sentiment. I knew I wanted a tag, so I just printed my sentiment on card stock and traced the tag shape. I think I should have layered it or distressed the edges... it needs "something" down in that bottom right corner. Maybe I'll fill it in with a pearl swirl - I'm open to suggestions! Oh, and the lace is sewn on - after I sewed the edges all around, I folded over the edge of the lace and slowly sewed straight across. As I went, I scrunched it up to give it the ruffled look. The lucky winner will be announced on Wednesday, April 7th, and will win 2 DZ doodles of their choice! Good Luck! Sketch and Stash #32 - Sketch - my "stash" is CC paper, leaves punched with a new tool and the eyelet added with my shiny new Crop-A-Dile II. OMG! What a great tool! I really appreciate that you're here, and hope you have a great day! Update: I am very pleased to tell you I've won the Midnight Madness Gold Star Award! I am floored and honored and speechless right now. :) Thanks so much, ladies! Can you believe it's already Easter?! Here in our Beary Scrappy neighborhood the eggs are hidden and the kids are ready to hunt! Here's Sweet Tilda, patiently waiting for the OK. She doesn't have far to look, does she? I've used Easter paper from Best Creation, and boy was it a treat! It's a nice weight and has just the right balance of "glittery shiny" and flat. I didn't feel the need to add a single drop of anything shiny to the paper... now *that's* a time saver! I distressed the small blue layer with scissors, and lightly inked edges of all the Best Creation papers with chalk ink. I really like Colorbox chalk inks because of their layering capabilities. Once a layer is dried, another layer can be added on top - much like coloring with Copics or Pencils. The layers blend together well and dry to a soft, matte finish. The Cat's Eye stamp pad is perfectly sized to dab quickly around the edges. Tilda is colored with pencils and her skirt is double layered with a touch of lace. Her trim is touched with Stickles, and she's raised up on Glue Dots for added dimension. I cut out small glittered eggs from the "Easter Words" card stock, chalk inked the edges and tucked them into the grass on Glue Dots. I used my trusty sewing machine to finish the edges! Paper: Bazzill Guacamole and an unknown brilliant blue; Best Creation "Easter Words" and "Playful Easter"
Medium: Prismacolor Pencils and OMS; Stickles "Star Dust"; Glimmer Mist Pearl; Colorbox Cat's Eye Fluid Chalk Ink "Creamy Brown"
Hello hello hello! Today is the first "official" day of the new DZ Doodles Design Team. I'm so glad to be joining these wonderful ladies and playing around with Diane's images. The sunflower is made of three layers, with some of the petals cut off for a 3D effect. Random edges have a little sparkle with Stickles glitter glue. The butterfly is a vintage image with little wire antennae! Hello dear friends! The design team is very excited at the coming arrivals at The Beary Scrap! Right now you can pre-order the delicious Basic Gray Kioshi, Magnolia's Hoppy Easter and new Kraftin' Kimmies Moonlight Whispers. 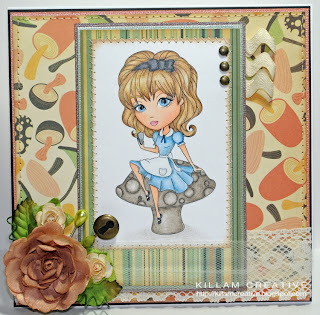 I'm over the moon at KK's Angry Ballerina stamp! This week, the Beary Scrappy Girls are celebrating BIRTHDAYS! Whoo hoo! Happy birthday to everyone celebrating this week. Although my big day isn't until May, Magnolia's Honey Tilda is here to celebrate with you! Tilda is colored with Prismacolor Pencils and blended with OMS (odorless mineral spirits). Her wings sparkle with Stickles and her antennae are made from black wires. After coloring her honey jar I covered it with Glossy Accents for a faux glass effect. I hope you've enjoyed your visit, and be sure to visit the TBS DT blog tomorrow for Patricia's birthday treat! 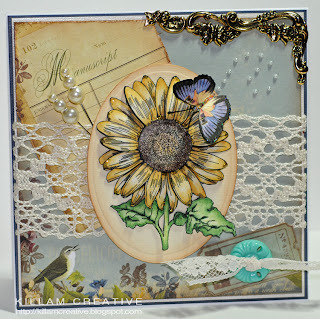 Edit 4/12: I am honored to announce that this card won a spot in the Fussy and Fancy Top 5! How cool is that? Thanks ladies! Hello! 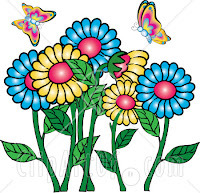 This week the design team at The Beary Scrap got together and decided Spring is the thing for us. As the week progresses you'll see new Spring-themed projects over on the DT blog, and check out the store blog for fabulous new projects from the in-store Beary Scrappy Girls. Paper - Basic Grey "Sugar Rush", Bazzill "African Daisy" and "Guacamole"
Medium - Prismacolor pencils, Glimmer Mist "Pearl", Stickles "Star Dust"
Thanks for stopping by - it means a lot to me! Hop along all of our design team blogs between 3pm PST Sunday (that's today!) and Monday night at midnight. Four of the sassy design team sistahs will be giving away a free image to one lucky random commenter, so be sure to leave love for all of us! The 4 winners will be announced on the SSD blog late Tuesday or Wednesday. There's more! Over at the SSD Blog you'll find all the "inspirational" details on our surprise challenge, which also runs through Monday night. But wait! There's even more Sassiness! 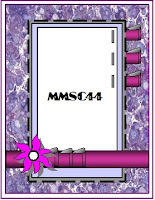 Come chat with us at the SSD Party Blog Sunday from 3 -6pm, PST. Who knows what will happen? Here's my new release card. I don't know about you, but I *love* this version of Alice in Wonderland. I used Cosmo Cricket "Earth Love" and Bazzill papers. The 3 little rick rack ribbon details are spritzed with Glimmer Mist "Pearl" and the previously-white big flower was covered with Glimmer Mist "Vanilla Breeze". I colored the pearl pin with Copic Sketch YG03. Alice's skin is colored with Copic Sketch E000, E01 and E11; her slightly rosy cheeks are compliments of a Prismacolor pencil. The rest of little Alice is colored with Prismacolor pencils & OMS, with a little clear Copic Spica here and there. Thanks so much for visiting today! From here you can visit any one of my DT sistahs! 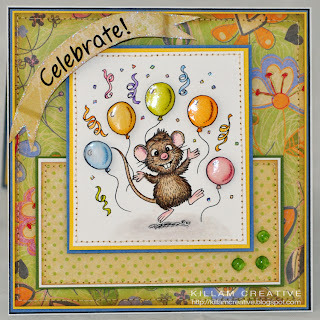 Have a great day, and I hope to see you at the SSD Party Blog today at 3pm PST! 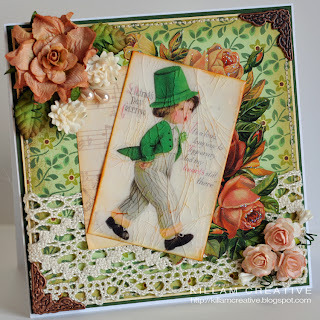 TBS DT Luck O' The Irish Week! I'd appreciate it muchly if you popped over to our new blog and let me know whatcha think! There are a bunch of tiny blings and shimmers: The Prima wild rose on the top left has been spritzed with Pearl Glimmer Mist, and the pearly pins were colored with a Copic. 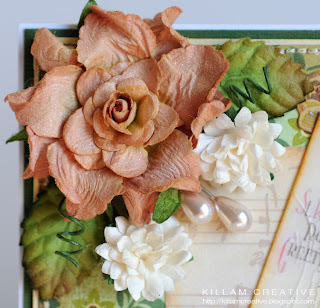 I've touched the leaf edges and the very tips of the pink roses with Tea Dye Distress Ink, and the vintage rose die cut is enhanced with Stickles Star Dust. Come Celebrate The Beary Scrap DT! Hello! 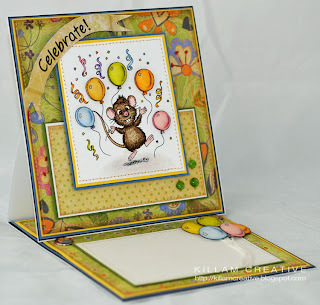 It's the final day of our "Celebrate" week at The Beary Scrap DT blog. It's been a fun week, and I hope you've had a chance to pop over and check it out! 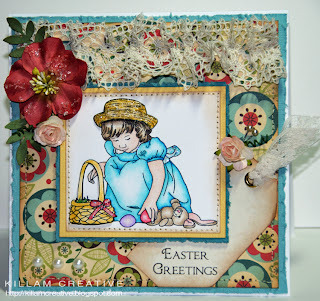 Today I have an easel card to show you - this is my second one and I *lovelovelove* the style! My easel card has a ton of layering, and it's all about Basic Grey's Sugar Rush. I've used 4 Sugar Rush papers for a little variety. :) If you're trying to figure them all out, the "Celebrate!" banner is printed on the flip side of BG's Bottle Cap. The banner edges are tricked out with Stickles Star Dust. I use Star Dust a lot - it's delightfully iridescent and picks up the surrounding colors. You'll see it on the confetti, too! My solid color layers are made up of Bazzill, and a few others from my stash. 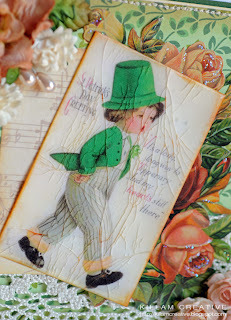 I'm a big fan of Bazzill grass cloth texture - even peeking out in layers it adds a little je ne sais quois to each cards. Haha! High school French... oh so many years ago. 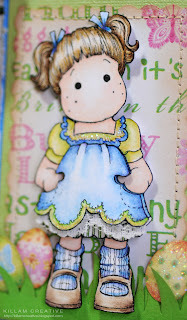 For a little added shine and sparkle, I've used Robin's Nest Dew Drops "Water" and BG's Sugar Rush Glazed Brads. 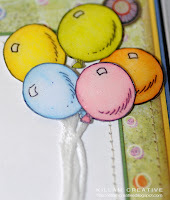 The balloons are finished with a glossy dimensional glue. 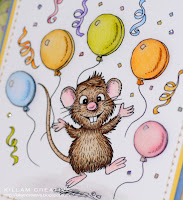 Bixby's little nose and his balloons are popped up with Glue Dots, as are the balloons on the "inside" of the card. Thanks for taking a look! Our celebration may be over, but have no fear! 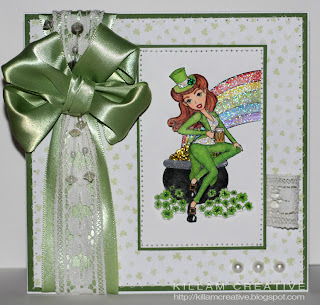 Next week I'll have a tutorial for you at The Beary Scrap DT blog, and our theme is "Luck O' The Irish". Of course, I've picked a technique I've never done before, so wish me luck! It's Time To Mix It Up! Hello hello! 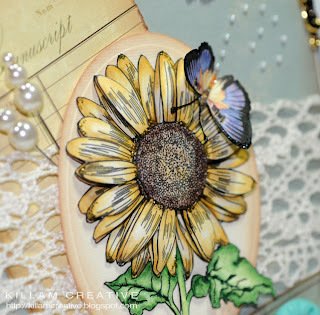 Welcome to the Sassy Studio Designs' Sassy March Mixer Release and Hop! If you arrived from Sara's blog, you're on the right track. 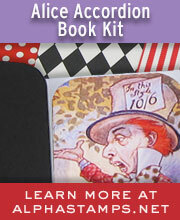 If not and you want to hop with us, start at the SSD blog, here. So we're mixing it up and adding a little mystery! Along the hop route three members of the design team will give away a prize. To qualify, you must leave a comment at every stop (just once at the SSD blog) by midnight PST tonight, and the three mystery blogs and the three winners will be announced at SSD tomorrow. I also want to show you a card I did a while ago. This is Satine, and she's probably my favorite digi and this card is most definitely a favorite of mine. Here is my original Satine post with card details. Your next stop is Val! If you're feeling chatty, join us at our Paper Craft Planet group 4-6pm PST (7p-9pm EST). See you there! 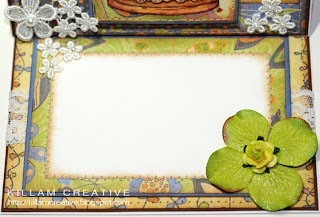 Sassy Studio Designs Blog - Start here!